Picture this story: you’ve just finished a pitch, and it’s gone well. The team in the room are smiling enthusiastically, keen to start enjoying the benefits of the solution you’ve outlined in your presentation. Everyone sees the logic of it, and they’re all agreed that it’s the best way forward. Actually, you can think of lots of ‘why nots’ but none of them can be voiced without destroying the positivity surrounding the end of the meeting. Will your contact present with sufficient vigour? Will they connect your proposition with the business challenges cleanly? Do they know enough about how your solution stacks up against competitive offerings to handle likely objections? Just like that, the risk of the wheels coming off your sale can start to feel huge. What do you do? To refuse to give over your slides to a staunch supporter feels churlish. You could offer to be there — at least in a supporting role — but if that’s not possible or appropriate, then there is another way: you could capture the sales pitch and deliver it as a complete package that your contact can share. There are multiple tools out there that will let you turn your presentation into a video for just that purpose. Even if you have to cut it down to get your message across in the allotted time, doing this means that you retain full control of your value proposition and how it’s presented to those stakeholders, instead of trusting your contact to do your job for you. And don’t panic – it is possible to condense your proposal into 5 minutes without losing impact; we’ve done it with clients who needed to distil their presentation down to the core of what makes them special, and deliver it within a strict time limit, and it’s worked. To successfully turn your presentation into a video, you’ll need to finely tune your script — just winging it in front of a mic won’t work, no matter how good you are — and use one of the aforementioned tools to layer that audio track over your slides (our favourite is Camtasia, but there are plenty out there). If you’ve got the time, you could even appear on the video in person so your audience can see who’s doing the talking. 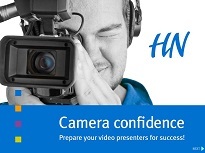 Have you tried turning your presentations into videos? Do you think it works? Get in touch on Twitter, LinkedIn or in the comments section and let us know what you think.